My Journey: I have been practising Tai Chi and Qigong since 1999. I continue personal development and training, so I can offer up to date tai chi and qigong benefits to my classes. 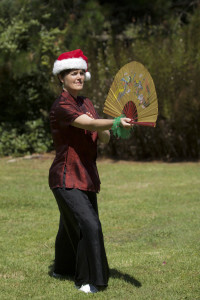 My dream is to help people connect their mind, body and soul … by incorporating tai chi & qigong into their daily lives. Moving gently, discovering your Qi, smiling within and learning to breathe effectively are the most important changes people can make to improve their health and happiness. the breath is the flow of intention. These are the “secrets” of Qigong.